Although it is clearly another of may repugnant displays of the individual’s core character, the nearly year-long affair that Trump had with Ms. McDougal, just months after the birth of his youngest son Barron, cannot be allowed to divert attention or camouflage the most critical issue that has ever faced the United States in its 242 year history. Clear and convincing evidence, and his own demonstrated behavior shows the World that the President of the United States is an asset and an agent of Russia. The evidence is now beyond question that Russia hacked the 2016 presidential election, and that it very clearly manipulated the electoral college in four states, giving Donald Trump the United States Presidency by a razor thin margin – despite his opponent receiving an over three million popular vote victory. Trump took Michigan, Ohio, Pennsylvania, and Wisconsin by roughly 70,000 votes, and there is now uncontroversial evidence that the Russian government hackers targeted those specific states with an enormous campaign to disenfranchise probable democratic voters. The campaign to disenfranchise probable democratic voters was timely coordinated with the Trump campaign, immediately after the DNC servers were hacked by Russian government military agents, during which hack Russia stole the entire accumulated DNC analytical data work product – the DNC plan to win those states. Former intelligence professionals with decades of experience, combined with the unanimous consensus of the entire intelligence apparatus, and this past week, Trump’s own Director of National Intelligence (DNI) and FBI Director have publicly confirmed that the election was hacked by the Russian Government, and the hack was specifically intended to give the presidency to Donald Trump. There is much speculation about what kompromat Russia has on Trump. However, there is literally no question that Trump is compromised, and that he is working in the interest of Russia – not the United States of America. Speculation ranges from Russia having video of Trump engaging in sexual activities that include some rather depraved engagements, to Putin having bought all of Trumps debt over the past decade, which gives Putin total ownership of the entire Trump organization. A grand jury has formally indicted Russian national Maria Butina on two charges, conspiracy and acting as a foreign agent without prior notification of the attorney general. With this surprise indictment, Maria Butina was arrested under allegations (and evidence) that she has worked as a covert agent, reporting directly to the Kremlin, engaging in espionage and a very deliberate targeted influence campaign to conspire to influence the 2016 election. Many shoes are expected to drop in the foreseeable future that will prove Butina’s sexual favors to high-level Republican elected officials. Maria Butina was instrumental in laundering tens, if not hundreds of millions of dollars into the 2016 Republican campaigns through the National Rifle Association (the “NRA”) over a period of several years leading up to the 2016 election. Maria Butina appeared before a federal magistrate judge on July 18, 2018 to determine her bond. Despite her counsel arguing zealously for her release on bond, the court found that the evidence against her is so compelling that she is ordered held without bond. U.S. Magistrate Judge Deborah Robinson said prosecutors had “demonstrated that no conditions [will] reasonably ensure” that Butina will return to court if she’s released from a federal jail in Washington. 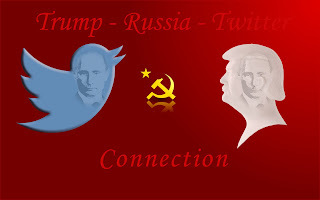 What has become a commonly used term over the past couple of years, “collusion,” is actually intended to characterize the deliberate cooperation between various parties to engage in illegal activities – in these instances between the Russian government and American citizens working in, with or for the Trump campaign, including Donald J. Trump and his family members. The legal term for what has been coined as collusions is “conspiracy,” and we are seeing more and more evidence that such conspiracy did occur between Russia and Donald Trump, his campaign and his family members, as a matter of factual information. As evidence piles up showing an entire lifetime of Trump corruption, New York Governor Andrew Cuomo indicated Wednesday that he is willing to authorize a criminal investigation of the Trump Foundation, which will bring criminal charges against Donald Trump, Donald Trump, Jr. Eric Trump and Ivanka Trump. The New York Attorney General is already pursuing a civil action against the Trump Foundation and is coordinating the Governor’s authorization of a criminal investigation. Although Trump has demonstrated a reckless disregard for the sanctity of the Presidential Pardon, the president cannot pardon state crimes. Trump’s nomination of Judge Brett M. Kavanaugh to the Supreme Court is proving problematic. Kavanaugh stated his belief in the Minnesota Law Review saying, "a serious constitutional question exists regarding whether a President can be criminally indicted and tried while in office." “In particular, Congress might consider a law exempting a President — while in office — from criminal prosecution and investigation, including from questioning by criminal prosecutors or defense counsel... The indictment and trial of a sitting President, moreover, would cripple the federal government, rendering it unable to function with credibility." 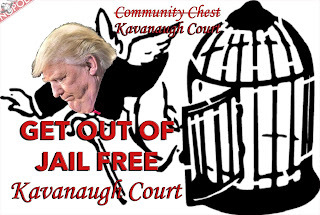 The very statement by Judge Kavanaugh that a sitting president should be exempt for mere questioning by prosecutors places the president of the United States above the law, making the person who occupies the office a King, free to recklessly disregard the law or public policy. We just witnessed Trump nearly agreeing to hand over former United States diplomats and ambassadors to Russia, to face corrupt proceedings that would result in either life imprisonment or death. It is rather obvious why Trump selected Judge Brett M. Kavanaugh as his nominee to the Supreme Court. He is the single pick that would likely protect Trump from his criminal prosecution. It is critical that all American’s call their U.S. Senators and zealously oppose the confirmation of Judge Brett M. Kavanaugh to the United States Supreme Court. It is important that America remain focused on the issues that affect Her continued democracy. The NFL, Trump’s sexual escapades, the litany o corruption all pale in comparison to the very clear fact that the president of the United States has knowingly and deliberately disregarded his oath to preserve, protect and defend the Constitution of the united States against all enemies, both foreign and domestic. Furthermore, America is witnessing complicity in the House of Representatives and the Senate, individual elected officials who are also failing to uphold this sacred oath.